Find out about the life of Harriet Tubman and how her brave actions working to "conduct" the Underground Railroad helped the Union Army in the Civil War lead more than 700 slaves to freedom. Learn about Harriet Tubman's life, achievements, and the challenges she faced along the way. The Level 2 text provides accessible, yet wide-ranging information for independent readers. 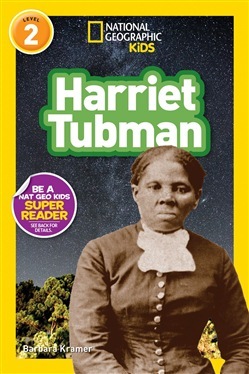 National Geographic Kids Readers have been a hit in the competitive beginning reader category, and this book builds on that success with the same careful text, brilliant photographs, and fun approach to high-interest biographies of fascinating people such as Harriet Tubman, that has proved to be a winning formula with kids. Acquista National Geographic Reader: Harriet Tubman (L2) in Epub: dopo aver letto l’ebook National Geographic Reader: Harriet Tubman (L2) di Barbara Kramer ti invitiamo a lasciarci una Recensione qui sotto: sarà utile agli utenti che non abbiano ancora letto questo libro e che vogliano avere delle opinioni altrui. L’opinione su di un libro è molto soggettiva e per questo leggere eventuali recensioni negative non ci dovrà frenare dall’acquisto, anzi dovrà spingerci ad acquistare il libro in fretta per poter dire la nostra ed eventualmente smentire quanto commentato da altri, contribuendo ad arricchire più possibile i commenti e dare sempre più spunti di confronto al pubblico online.